Tucked into the southeast corner of Chicago's Streeterville neighborhood, the Embassy Suites Chicago Lakefront is part of River East Center, a development that includes the hotel, luxury condominiums, an upscale bowling alley/lounge, a restaurant, and a 21 screen movie theater. 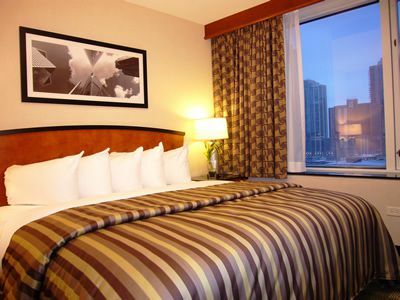 This location is ideal for tourists, as the hotel is within .5 miles from Navy Pier, Michigan Avenue shopping, the River North entertainment district, and the lakefront. The attentive service at the Embassy Suites Chicago Lakefront begins the moment you pass through the doors, where guests are greeted by bellmen, eager to take your bags. Guests then take the elevator up to the hotel's soaring atrium to check in. The atrium features a contemporary waterfall, fountain, and several seating areas for those that want to settle in and take advantage of the hotel's wifi. The hotel also has a fitness room with modern equipment and a small pool. The hotel went through an $11 million renovation in 2008, and it shows especially in the rooms. The decor and furniture are clean, contemporary, and tastefully done, and with the separate bedroom it feels more like an apartment than a hotel room. The rooms feature a microwave, small refrigerator, and a wet bar, which makes it easy to take advantage of the full-sized grocery store across the street. Many rooms -- especially on the upper floors, naturally -- provide excellent city or lake views (and in the case of some corner rooms, both). The quality of the linens and pillows made me think I had brought them from home -- no scratchy sheets or ugly thin comforters here -- and the bed was the most comfortable I've experienced in a hotel of this price range. What adds a lot of value to the Embassy Suites are the Manager's cocktail reception and the complimentary breakfast, both of which are very popular. While it's questionable if it's worth it to stand in a long line for a free drink, the breakfast certainly is. While most hotels that provide breakfast just put out an array of muffins and stale bagels, the Embassy Suites offers a full breakfast buffet with items like scrambled eggs, bacon, pancakes, pastries, fruit, juice and coffee. They also provide a made-to-order omelet station with an array of extras that allow you to mix and match and get your omelet however you want it. The breakfast certainly isn't gourmet, but it's very good as well as convenient since there is a lack of good breakfast options in the area. The Embassy Suites is great for families and this property is no different. Besides being situated near tons of family-friendly attractions, the two room setup is ideal as it provides a couple options for privacy -- a suite with a king size bed allows mom and dad to adjourn to the separate bedroom while the kids sleep on the sofa bed in the living room area. Or, with a suite with 2 queen size beds, the little ones can be tucked in early while the grown-ups enjoy an on demand movie on the couch. Either way, you can see how it would be appealing to parents -- which would explain why on my visit the hotel was crawling with children. So if you have an aversion to sharing the lap pool with a bunch of 6-year-olds, you might want to go elsewhere. But other than that, the Embassy Suites Chicago Lakefront is a great choice of hotel when traveling to Chicago. As is common in the travel industry, the writer was provided with complimentary accommodation for the purpose of reviewing those services. While it has not influenced this review, About.com believes in full disclosure of all potential conflicts of interest. For more information, see our ethics policy.